Gormenghast author Mervyn Peake lived to his death here. 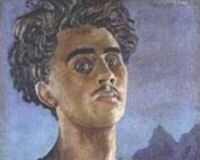 Description: Author and artist Mervyn Peake (1911-1968) lived out his life here from 1960 until his death in 1968 from Parkinson's disease. He was educated at Eltham College, Kent from 1937, and his most popular work is the Gormenghast Trilogy, a singular gothic fantasy of tremendous proportions that is made up of the books Titus Groan, Gormenghast, and Titus Alone.